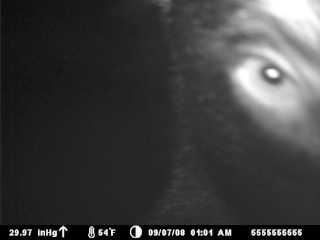 I had this bear on my trail cam in 2008. A little creepy looking. This is the time of year when a mother bear chases off her two year old cubs. The mother is going to look for a mate and no cubs can be with her. The cubs must find an area to live in. The females are easily accepted as a possible mate and are not chased off by rivals. Male cubs on the other hand are constantly challenged by other male bears if they are in an established male's bear territory. The young male bears, are chased out of their home area and must find a new territory to live in. What does this mean for beekeepers? These young bears can pick a territory that normally doesn't have bears. So, a beekeepers that has never had a bear fence is a ripe target for these young bears. If you are near any areas that have had bears, you may want to consider a bear fence. This is a link to the MN DNR and their bear fence design. The material costs are way off, but the design is solid. A bear fencer should be 12 volt and put out at least 2 joules of energy. Congratulations to all the participants in the Bee and Honey Competition at the MN State Fair. All of the entrants took the time to enter a quality product. Hard work, attention to detail and the desire to say, I have the best in the State of Minnesota. The Honey Sweepstakes winner was Grand Champion Kurt Walleser of Rochester. The participants have all helped to promote the whole bee industry and to promote our craft of Beekeeping. I think all beekeepers want to thank everyone who displayed their products. I treated for mites, what's next? When the mites have been treated, making sure I have enough food stores for winter is next on the agenda. Actually, when putting on mite treatments is the time to check the food stores. Most of the mite treatments involve taking off the top deep honey box. A feeding plan should be developed, and a plan made of when and how to feed at the same time when looking at food stores. The top box needs to be pretty much full of honey for winter stores. As I take the top box off, there are two things I look and feel for. I feel for the weight of the box. This quickly tells me how heavy the box is. I then tip the box back and look at the bottom of the frames. A little smoke on the frames gets the bees off the bottom of the frames. I want to see capped honey to the bottom of the cells of the frames. When bees fill honey frames, they start at the top of the frame and work their way down the frame. Just looking at the top of the box does not give an accurate description of the honey stores. Looking at the bottom of the frames, gives a true assessment of the amount of honey in the box. Typically, the bees will fill the center core frames in the top box. The frames more towards the outside of the box may not be filled as much. When I check for food in the box and determine the center frames are full and the outside frames are light on honey. I pull the center frames and move them to the outside and move the less full outside frames to the center. Then, when I feed, the bees are more likely to fill the center frames quickly. 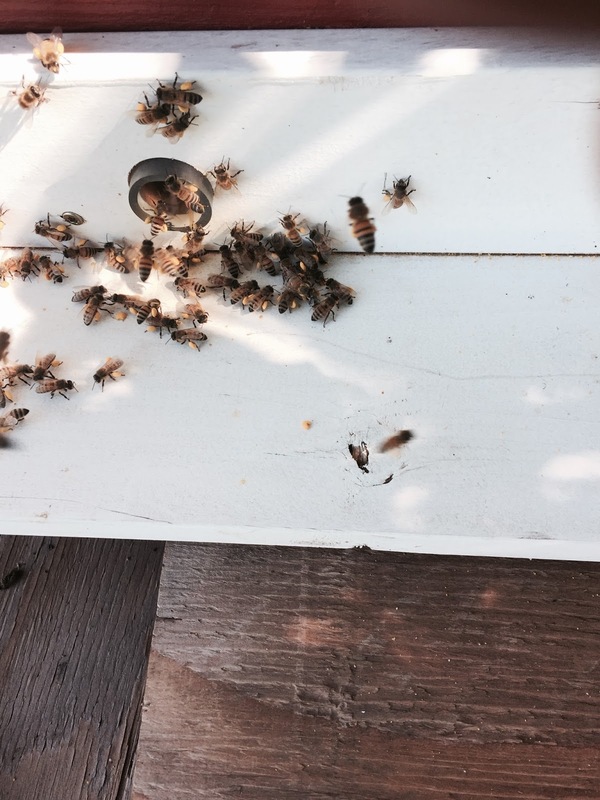 Bees never do a good job filling the outside frames. Most mite treatments say you cannot feed during the treatment process, other than ApiVar. Feeding needs to be started and finished as fast as possible. Feeding should not be dragged out for several weeks. As the colony is fed, the bees look at it as a nectar flow. During a nectar flow the queen is stimulated to lay eggs and produce brood. Beekeepers want the queen to stop making brood by early to mid October. Then a treatment of Oxalic Acid can effectively clean up any mites that are left on the bees. This leaves a hive as healthy as possible and ready for the rigors of winter. Now here is the issue: If feeding continues late into the season, there will be brood in the colony for about a month after the feeding stops. As the colony makes brood, there is the opportunity for more mite reproduction. The bees also have to feed the brood and keep it warm. Feeding late, say into October, a hive could have brood into November, sometimes as late as December. Caring for the brood will make the hive consume food, this can put a strain on a colony that needed more food to begin with. As fall progresses towards winter, the cooler weather makes it more difficult to feed. The bees do not like cold syrup and may not take it anymore. So get mite treatments done NOW. There is work to finish to get the bees everything they need for winter. Beekeepers that get this done will be in much better shape for winter survival. There are many things to do in a short time. Pulling honey, extracting honey, mite treatments, feeding, not necessary in that order. It is now mid August and fall will be coming on fast. Beekeepers need to get many chores done very soon. There will be several posts about what we need to get done. Mite treatment: Mite treatments should be put on now. Waiting to treat for mites can jeopardize survival of your bees. Mites with time, damage your bees. If the bees are damaged too much by mites, even if you treat the bees, they will not survive the winter. Some Mite treatments can be put on with supers on. such as Formic Pro and Mite Away Quick Strips (MAQS). Both of theses mite treatments cannot be put on if it is above 85 degrees for the first three days of use. ApiVar cannot be used with supers on. ApiGuard cannot be used with supers on. It looks like Goldenrod pollen is the food of the day. With the upcoming end of the nectar flow. Beekeepers will need to pull their honey off their hives. Here is a couple videos of how to pull honey. The nectar flow, as it is right now, is about 90% done. This time of year the flow gets very spotty. One beekeeper is getting nectar others not. For many beekeepers the flow is over. There are some Alfalfa fields still flowering. If they don't get cut, there will be some honey there. The main flower at the moment is Goldenrod. Goldenrod is blooming everywhere. Fields are becoming thick with yellow flowers. It certainly looks impressive and beekeepers are licking their chops at this huge flower show. But lets get real. Goldenrod is the most devious flower. While beekeepers think we are going to get this huge crop of Goldenrod honey, time and again we are left with unfilled supers and unfilled hopes of a late crop. 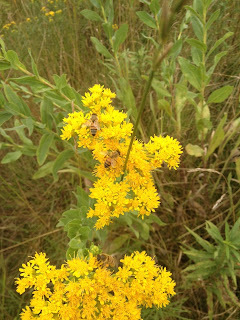 Goldenrod is a fickle flow, once in a while there is nectar in the supers, but I usually don't plan on it. About ten years ago I got two supers of Goldenrod honey but not much since then. Other beekeepers have fared better. But being the yellow flower is there, I am always the eternal optimist for some stinky nectar. Stinky nectar? What's up with that statement? Goldenrod nectar when it is high moisture content smells like wet sweat socks. As the nectar ripens the odor goes away. Goldenrod honey does have a distinct flavor. Goldenrod nectar may be coming your way, so I hope your hive's stink up the beeyard. We have extended our extractor sale until August 19th. There are some volunteer opportunities at the fair. Volunteering at the fair is fun. Answering questions from the general public is a big help in promoting beekeeping. The booth at the state fair is a major draw at the fair and really helps get the message out to the general public about beekeeping, pollinators, and honey. Beekeepers score big in public opinion by what they see at the fair. Volunteering is a great way to help. Any first year beekeeper knows more than the general public. Don't sell yourself short. If you don't know an answer to a general questions, there will be someone there that can answer it. But most of the questions are easy for a first year beekeeper. Sign up now, you get a free ticket to get into the fair. There is a honey demonstration sign up, a exhibit hall volunteer, and pre-fair setup volunteer. Right now is a perfect time to treat for mites. Just because you don't see mites doesn't mean that they are not there. If you start seeing mites on bees the mite population is very high in the hive. Be proactive, the hive you save may be your own. The weather is perfect right now for Formic Pro or Mite Away Quick Strips. Both of these treatments are considered organic and can be applied with supers on the hive. Treating now will lower the mite population before the bees start making winter bees, which usually starts around mid to late August. Winter bees are the bees that live through the winter. Winter bees have a different physiology than summer bees. Winter bees have the ability to store more lipids (fat) in their bodies. Having winter bees as mite free as possible is the key to overwintering success. 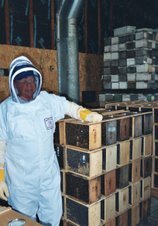 Waiting to treat your bees into September can cause your winter bees to be weakened and get viruses by a higher mite population. The odds of survival are much lower. Dave Dahl from KSTP is forecasting hot weather coming back in about a week. If it is too hot, you may not be able to use Formic Pro or MAQS, other mite treatments will have to be used. We have a new mite treatment in stock and ready for sale now. This mite treatment is called Formic Pro. It will be the replacement for Mite Away Quick Strips (MAQS). It is manufactured by the folks who gave us MAQS. Basically it is the same product. Looks the same and the application process is the same. The difference is, the treatment is a two week treatment instead of a one week treatment. It should be more effective for Varroa mite control. Supers can be on during the application of Formic Pro. There is an extended shelf life of Formic Pro of two years compared to 6 months for MAQS. This is a video of what the mite treatment looks like and how it is applied to the hive. We have all of our extractors on sale this coming week. Our lowest prices of the year. One week only. Have a big honey crop? We are offering the 9/18 motorized reg $1395.00 now the 9/18 motorized extractor on sale for $1175.00. This is a radial extractor and does 9 deep frames or 18 medium or shallow frames at once. Prices good until August 11th, 2017. We are taking pre orders now, delivery to Nature's Nectar LLC in Stillwater MN within 7 days, depending on availability. We will be able to make sure they will be available when you order. You can stop by and look at these extractors. The advantage of ordering from Nature's Nectar LLC is all warranty work is done here. When you order online and there is warranty work to be done, can you imagine what it would take to ship it back for service and the cost? Buy local. save money and save on a possible big hassle. This is a basic video that shows several tools to pull the honey off of the hive. All of the tools work, some better than others.